As most companies will tell you, 2009 has been a turbulent year, given the global economic circumstances. Many organizations across a range of vertical markets have significantly reduced their IT and communications budgets or have placed major projects on hold, which has clearly impacted consumption of communications networks. The Missouri Department of Transportation (MoDOT), one of Spacenets key public safety customers, was awarded the Innovation & Technology Award for 2009 at the International Satellite & Communications Exchange (ISCe) Conference. MoDOT teamed with Spacenet and Orbital Data Net (ODN) to design and implement its innovative emergency communications satellite solution. The solution integrates terrestrial communications assets with satellite connectivity for a complete continuity of operations and first responder solution. This satellite solution enables the agency to fulfill its mission of ensuring public safety with constant access to critical communications during emergency situations and is based on fixed and transportable satellite systems, all the while supporting full Voice over IP (VoIP) and Radio over IP (RoIP) capabilities with Quality of Service (QoS), Internet access, and can interface with trunked radio systems and analog systems. The solution enables seamless transmission capabilities and control to communicate and interconnect remote tower sites by satellite, and interoperability with legacy systems. The team also created a unique telephone solution, Satellite Transport Audio Circuits (STAC) that provides efficient and cost effective voice services. Spacenet and a leading technology company in the Land Mobile Radio (LMR) market introduced new emergency response services that help public safety organizations maintain reliable and secure communications in virtually any situation, including a new interoperable LMR and satellite solution. This solution is suited for a wide range of public safety organizations. To avoid the risk of being vulnerable to local outages during emergency situations (as most LMR systems are networked via terrestrial technology) and ensure constant access to communications, satellites can provide seamless backhaul for LMR and provide backup to terrestrial lines that support the Public Safety Access Points (PSAPs). Spacenet introduced its new Prysm Pro application and network appliance to help multi-site enterprises support multiple secure networks with centralized management and hybrid switching between wireline and wireless technologies. The innovative Prysm Pro is a modular, scalable, off-the-shelf IP network appliance that offers unique features and can be customized to support multiple secure wireless networks. Spacenet also introduced its new Cisco integrated Federal Information Processing Standard (FIPS) 140-2 certified encryption solution over satellite in 2009. The FIPS certified solution from Cisco and Spacenet provides new satellite communications options to government customers, including services for CONUS based Department of Defense agencies and backhaul services between EMEA and the U.S. using their existing Cisco infrastructure. Spacenets integrated VSAT Cisco solution supports FIPS 140-2 as well as acceleration of the encrypted traffic without the need to install additional devices at the remote location. The solution uses the Spacenet and Cisco co-developed Integrated Acceleration and Encryption (ITAE) technology to provide end-to-end accelerated FIPS 140-2 certified encryption over satellite. Another focus in 2009 was on the American Recovery and Reinvestment Act (ARRA). The satellite industry, as a whole, has worked hard to make sure that satellite plays a key role in the economic stimulus initiatives and the national broadband strategy. Spacenet, as one of the pioneers of rural communications in this country, placed a significant amount of focus into this initiative and submitted multiple proposals to the U.S. National Telecommunications and Information Administration (NTIA) to provide broadband access via satellite to rural and underserved areas. 2009 introduced new challenges for Spacenet given the global economic situation. Our response to the situation has been to work harder and more creatively in order to find new opportunities that leverage our technology advantages. Although we dont expect the economic situation to change overnight and realize it will take time for companies to recover, we are optimistic about the future and believe that the changes we have made during the hard times will pay off. 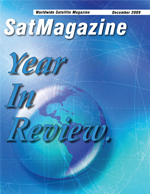 One major initiative that we plan to leverage in 2010 is the launch of our new SkyEdge II VSAT platform. SkyEdge IIs advanced technology enables Spacenet to offer an even broader range of service options for our clients with high multi-megabit per second bandwidth requirements. The SkyEdge II platform is optimized for IP applications, VoIP networks and two way video; offers faster speeds than previous generations; provides higher availability (99.9 percent or better); and supports high-speed mesh services. We also plan to continue focusing on our traditional enterprise market with an increased focus on providing managed services. We will continue moving towards more specialized and higher value markets. The increasing need for high availability networks and emergency communications among IT Managers across many different industries presents an opportunity for satellite. In some markets, satellite provides a high value proposition that goes beyond simple network connectivity. We will continue to ramp up our offerings for the first responder market. Public safety and emergency response is a critical area where satellite provides a strong value proposition. Its also notable for the way satellite has been integrated seamlessly into their terrestrial network to support voice over IP as well as LMR applications. Overall, Spacenet will continue to adapt to the changing environment and focus on providing highly reliable networking solutions across both our core and expanding markets, enabling organizations to benefit from the latest in converged data, voice and video communications via satellite.